This recipe uses two great products that can help you expedite your cooking: jarred garlic and ginger! Another great tip for busy nights: Bake, broil, grill or poach chicken breasts at the beginning of the week, and you'll have them on hand for meals throughout the week. Combine the soy sauce, hoisin, water, and cornstarch in a small bowl. Stir to combine; set aside. In a flat bottomed pan or wok set to high heat, add the oil, garlic, ginger, and Thai hot sauce. Stir fry for 1 minute. Add the vegetables and chicken. 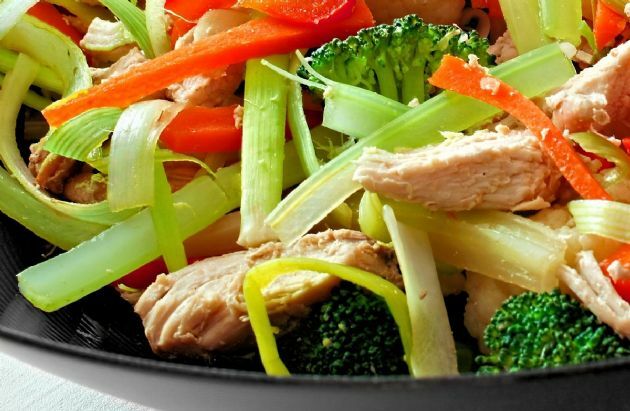 Stir fry, moving all ingredients in the wok quickly for 3-4 minutes. Add prepared sauce and continue to cook until the liquid thickens. Serve with brown rice or rice noodles. Makes four two cup servings. When stir frying, I always cook the meat first (especially with chicken) to make sure it gets cooked through. Remove from wok and stir fry veggies, adding meat back at the end.